Urban S31 mainstream mid-tower, categorized in Thermaltake latest chassis collection – Urban Series. The entire series has a simple and elegant aesthetic, design for users who looks for everything but a flamboyantly appearance. Built with brushed aluminum finish front door panel to mask the extrusive drive devices, not only unify the appearance, but also provide a simple yet sophisticate aesthetic. The perforated front-top panel has implemented two of latest data transfer SuperSpeed USB 3.0 ports along with two USB 2.0 ports, a HD microphone and headset jacks, to grand direct access when needed. The preinstalled sound-damping foams for extreme silence purpose on both side panels of Urban S31 reduce noise and acoustic levels within the chassis. Top-mounted 2.5” or 3.5”HDD Docking Station enables blazing fast file transfer and effortless hot-swap drive replacement design for easy setup or removal of optical drives and HDD. 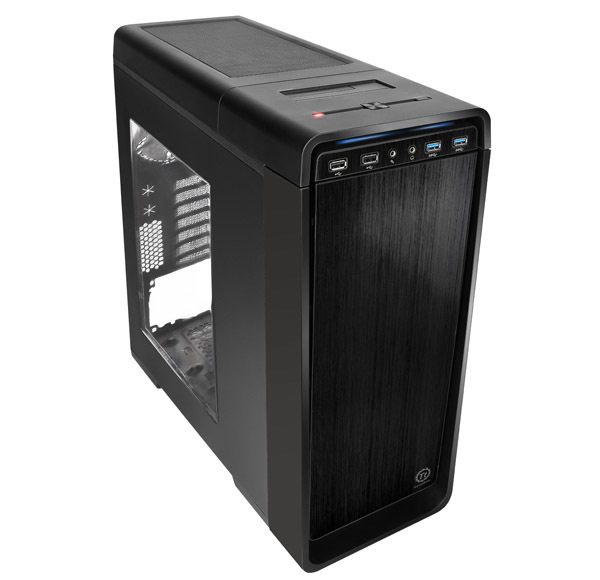 Urban S31 mainstream mid-tower, categorized in Thermaltake latest chassis collection – Urban Series. The entire series has a simple and elegant aesthetic, design for users who looks for everything but a flamboyantly appearance. Built with brushed aluminum finish front door panel to mask the extrusive drive devices, not only unify the appearance, but also provide a simple yet sophisticate aesthetic. The perforated front-top panel has implemented two of latest data transfer SuperSpeed USB 3.0 ports along with two USB 2.0 ports, a HD microphone and headset jacks, to grand direct access when needed. The preinstalled sound-damping foams for extreme silence purpose on both side panels of Urban S31 reduce noise and acoustic levels within the chassis. Top-mounted 2.5” or 3.5”HDD Docking Station enables blazing fast file transfer and effortless hot-swap drive replacement design for easy setup or removal of optical drives and HDD.